Barcelona have traditionally been recognised as a side possessing the most remarkable attacking talent. In recent times, Rivaldo, Ronaldinho, Thierry Henry, Neymar, Luis Suarez and Lionel Messi are just a few of the world class talents to pull on the famous Barcelona shirt. As Messi seemingly breaks every goalscoring record in Barca's history, we take a look at their top ten all-time goalscorers. ​Mariano made his debut for ​Barcelona in 1939 aged just 20, and went on to amass 128 goals in 150 appearances during a prolific nine-year spell with the club. His impressive tally just sneaks him into the top ten, ahead of club legends Patrick Kluivert and Hristo Stoichkov. The Spaniard would be further up the list but for a debilitating knee injury suffered in 1944, that he was unable to fully recover from. After scoring 114 goals in five seasons before injury struck, Mariano managed to net just 14 times in the following four seasons, in what was a sad end to his Barcelona career. Rivaldo was welcomed to the Camp Nou in 1997, with the Brazilian dazzling fans during a five-year spell in Catalonia. He possessed great pace and dribbling ability, combined with a freakishly devastating free-kick, allowing him to rack up 130 goals for the club. After endearing himself to the fans by scoring wonder goal after wonder goal, Rivaldo left the club in 2002 under controversial circumstances when Louis Van Gaal returned to Barcelona, swiftly releasing the Brazilian from his contract.  A 5aside team of the best players that Samuel Eto'o has played with . . .
Samuel Eto'o's impressive form for Mallorca earned him a €24m move to the Camp Nou in 2004. During his spell with Barcelona, Eto'o established himself as one of the deadliest strikers on the planet as he bagged an incredible 130 goals in just 199 appearances. The Cameroonian enjoyed a well decorated spell with Barca which included three ​La Liga titles and two Champions League triumphs, before he made the move to Serie A, joining ​Inter in 2009 for the lofty sum of €46m. Paulino Alcantara shot to fame after bagging a hat-trick on his debut, during a 9-0 win against Catala SC back in 1914. His exploits mean that Alcantara remains Barcelona's youngest ever player to score in an official match at the tender age of 15 years, 4 months. After a two-year spell away from the club, Alcantara returned to Barcelona in 1918 when he cemented his legacy. He bagged 143 official goals during a decorated nine-year spell in Catalonia, with the striker capturing 17 major honours before hanging up his boots in 1927 to become a doctor. In sixth place is Spanish striker Josep Escola, who began his illustrious career with Barcelona in 1934. Known as 'The Professor' for controlling his team-mates' emotions on the field, Escola racked up 167 goals during two spells with the club, before also having his career cut short by injuries. Escola was plagued by hip and knee problems which forced him to retire at the age of 34, not before he managed to capture two La Liga titles. ​​Luis Su​arez recently became the club's fifth-highest goalscorer of all time after just five seasons, boasting a record of 167 goals in 227 appearances. After a difficult first season, Suarez enjoyed a marvellous second term as he netted 59 times across all competitions during his best ever campaign. As he continues to score freely in the blue and crimson shirt, Suarez could reach second place in the all-time scoring charts if he remains in Barcelona. Currently 65 goals behind Cesar Rodriguez, anything is possible for the prolific frontman. Josep Samitier was nicknamed 'The Grasshopper' due to his position that created the 'box-to-box' role. Naturally a midfielder, the Spaniard's goalscoring exploits are made all the more remarkable as he netted 184 official goals for the club, placing him fourth in Barcelona's list of all-time leading scorers. Samitier controversially left the club in 1932 to join ​Real Madrid, but will always be remembered as a legend of the club having returned to manage Barcelona, capturing the La Liga title in 1945. ​After joining Barcelona in 1950, Laszlo Kubala wasted no time displaying his vast talents at the Camp Nou. He enjoyed a stellar first season, scoring 26 goals in 19 games including seven in one match against Sporting Gijon - a La Liga record that remains for the most goals scored in a game. His goalscoring antics showed no sign of slowing down during the ten years he spent at Barcelona as Kubala racked up an incredible 194 goals, before briefly retiring to become a youth coach at the club. In second place, after holding the crown for some time, is Cesar Rodriguez. The Spaniard scored 232 goals in 351 matches, making him the club's leading scorer for an impressive five decades. After making his debut at 19, Cesar, like so many before him, enjoyed an illustrious career at Barcelona as he scored goals for fun, contributing to five La Liga titles during a 16-year spell at the club. No surprises who leads the way, it's ​Lionel Messi. Arguably the greatest player to ever walk the planet, Messi is a phenomenon whose talents may never be replicated. His record speaks for itself, Messi has scored 577 goals during 661 appearances for the club. 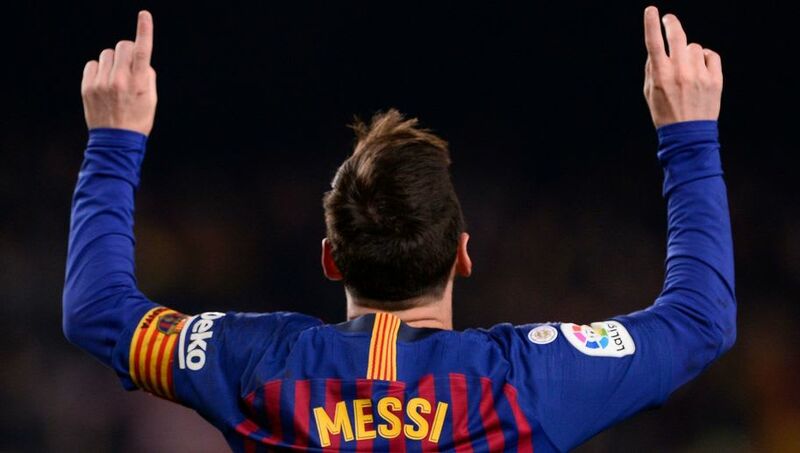 After coming through the famous La Masia academy, the Argentinian has broken nearly every record in the book: most goals (577), most hat-tricks (43, yes thats 43), most goals in a calendar year (73) and the list goes on. Having won the Ballon d'Or a record five times, Messi will always be remembered as one of the greats. With the forward turning 32 later this year, he is entering the final stages of a simply remarkable career. *Luis Suarez and Lionel Messi scoring totals as of date published.